Lately, I'm sick of the sound of my own voice. Moaning on about my first world issues. Busy, overstretched, petty irritations. It's all such minor stuff. Nothing that will have left the slightest ripple a few years from now. It's good to step away from all of it. To reframe and refocus on higher things. I've always had a great deal of admiration for people with a grand plan. Something on a large scale, requiring vision and tenacity. Beautiful gardens are a prime example. To take a piece of bare earth and have a vision of it so many years from now that it is worth investing in the saplings which will one day be the pefect pleached hornbeams, framing a game of boules. To keep in mind, through the daily grind of weeding and watering, the vista of your imagination. But still, in the midst of achieving the master plan, to take pleasure in the small details and the happenstance beauty. It was a cold day yesterday, drizzly, with that low cloud and strange milky light we do so well in Britain. Not really vintage garden photography weather. But still, the soul of Hidcote shone through. It was good to walk and chat and soak in the green. Perhaps my normal voice might even be back. The one which doesn't whinge and whine. Thank you, Sue - a good suggestion. A green day was the perfect tonic. Over lunch today - leftover rice with kale and shredded chicken - particularly tasty, even if I do say so myself, I was catching up with reading a few blogs. Suse used the phrase 'it's just the usual around here, nothing particularly worth recording'. Which sums up neatly exactly my excuse to my Mother, who chided me for my lack of updates recently. But I've been trying to step away from the online world a little and immerse myself more fully in the real life rhythms of my day to day. Investing my time a touch more mindfully in the things I know will bring me pleasure later. Serene? Well, looks can be deceiving. I've just had the usual nervous breakdown inducing session of transferring the seasons sports fixtures into the family diary. Quite why I am bothering with the garden when there are probably 6.3 seconds when we will have free time to sit in it and enjoy it, I haven't quite figured out yet. On a completely different note - duck racing anyone? Highlight of the village social calender. We managed two ducks in the final, but failed to secure victory. There were ice creams though, which more than made up for any disappointment. There was just time for a smash and grab run out to the garden. A posy of what's in flower this weekend. The roses have largely been ruined by the deluges, but the hypericum seems extra good this year. And the smell of the philadelphus is totally intoxicating. I seem to have overcome my reluctance to cut flowers in the garden to bring indoors, but have exposed a serious lack of small leaved foliage in my garden to use in posies. What do you grow for that? Look at photos of flowers. Erase all thoughts of passport related stress. Two visits to the Post Office, three forms, two sets of photos. Does it really have to be this hard? The cutting patch is beginning to bear fruit. It was a bit of a leap of faith putting bulbs and seeds in the bare earth and waiting for Mother Nature to do her thing. But it's a good lesson for those like me who tend to succumb to the lure of instant gratification. Sometimes good things really do come to those who plan and wait. And those crazy orange tulips - they lasted a week in the vase. Yes, things in the garden really are looking rosy. Spring has sprung in the bathroom. The first branches of Forsythia, forced indoors. I like to think of it as pre-emptive pruning. That way I don't feel bad about hacking chunks off my shrubs. D'you think this is what they mean by adding some extra colour to your winter garden? Yes, that is my garden (though not my peacock). They are feral in our neighbourhood. The village is divided between the peacock lovers and those who view them as pests and like to publish recipes for peacock pie. We're fans (though they take a bit of cleaning up after - the size of their poos is alarming). Not that our garden is pristine or anything. In fact, I've only just got round to clearing a lot of the fallen leaves from the borders. It's a good excuse to be outside. Clear skies, lengthening days. All good. Enjoy your weekend. At the beginning of Autumn, flushed with enthusiasm about growing my own flowers for cutting, I placed a bulb order. A rather substantial one. And I managed to rally the troops to help me build a new raised bed and dig trenches and holes in which to plant many of the aforementioned bulbs. Some of them, though, I popped into pots and containers with the notion of forcing them in time for Christmas. Well, the forcing bit went well, though the timing is clearly a wee bit off. I may have to re-think a few of my gift plans. But if all the bulbs perform this well, we should be in for a bumper Spring. Ever since my 'growing flowers for cutting' fascination began, I have harboured a parallel obsession with vessels. See, in the flower workshop at Green and Gorgeous, there is a cupboard (and a dresser or two) and they are full of the most amazing array of bottles and jars, vases and jugs and the odd tea cup and gravy boat too. And it gave me such a case of the screaming wanties, that I considered for a moment, a secondary career as a crockery kleptomaniac. But because I am a law abiding citizen, I decided I'd better start my own little collection. And it's been going well. In the past, I have veered towards very plain, glass containers. My interior style tends towards the simple and utilitarian, over anything more flamboyant and they seemed safer somehow. But then I came across a new book Vintage Flowers by Vic Brotherson (there are some page shots on that link). And I've been blown away by her use of vessels. Such unfettered joy. A true floral 'in your face'. And her words on choosing the right vase? Try to keep as many water holding vessels in your home as possible. And armed with those words, perhaps my comfort zone is expanding. Into the realms of this little blue pot, which spoke to me and begged to be filled with allotment nasturtiums. And somehow manages to make even the uncleared breakfast table into a brighter place. 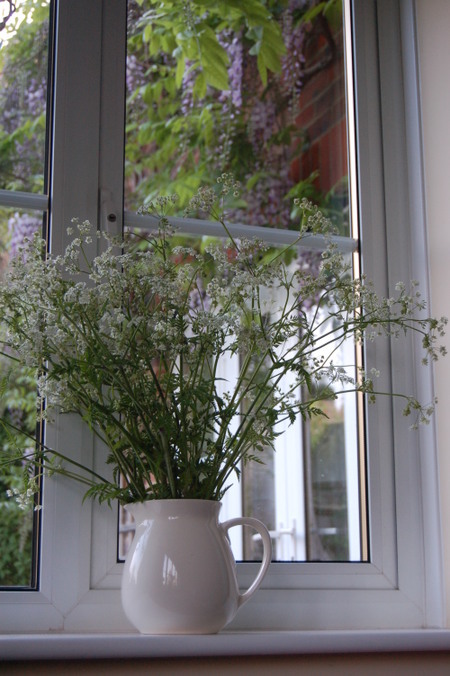 In Vic's book I had also read about window vases - a narrow vessel which was originally used as a way of showing off to the neighbours, bu putting your finest booms on display on the windowsill. Look at hers. Feeling wanty yet? Well lookie what turned up in my junk shop - and not just one, but a pair! Must've been my lucky hunting day. And then there are some which I have aquired, and not yet had the chance to use. But can't you imagine this one filled with autumn hips and ivy berries? Can you tell I'm excited about this? Funny, but when you have a new interest, somehow there seems to be so much inspiration around. I've been pinning like crazy. And some of the inspiration has even lead to action. Do you have loads of vases and flower receptacles? Or am I in danger of going a little over the top and turning into the single white female of the floral world. And if I am, Concha had better beware, because I've always had a bit of a thing for her way with flowers. And Belinda too, while we're at it. Taking a firm hand with my garden was one of the motivating factors when I signed up for a day at Green and Gorgeous learning about growing your own cut flowers yesterday. Well, that, and the fact that I am utterly seduced by their farm. It's a magical place - Johnny captured a little corner of it earlier this summer - health warning - the camera is extremely unsteady as he trots about - beware of motion sickness! Yesterday, was less wandering and more focussed on the nitty gritty of planning and growing. And I got to spend the day with Tracy (though we were too busy scribbling notes to chat for much of it). Apart from during a very yummy lunch, (vegetable lasagna, home grown tomatoes with basil and salad and almond meringue with garden raspberry coulis and cream) which I was too busy snarfing to photograph. And when I got home, I could look at my beautiful flowers and begin to plan all that I want to achieve outdoors next season. Starting off with making up a bulb shopping list. Mine includes Muscari, Triteleia, Scented Narcissus and of course Tulips. Summer is the season where you truly do reap the fruits of your labour. In Mark's case, radishes from his section of allotment. His scout group have a plot, which they have subdivided and have earnestly planted and watered. I though they would get bored with it quickly, but it seems they have more staying power than I gave them credit for. And their radishes were wonderful. Of course, I am the only member of the family who really likes radishes, which probably doesn't make them the finest choice of crop. But is fine by me. And they are photogenic. As is the new season's garlic. Though this didn't come from the allotment - it's being grown on a slightly larger scale. Recently, I stumbled across the Green and Gorgeous blog. They are flower (and vegetable!) growers, based on an organic farm, not far from me and I took the opportunity to visit this weekend, when they were open for the NGS. What a magical place. So magical that I have booked myself ono one of their courses. And am planing on making a return visit with my decent camera. In September, I will be learning all about planting a cutting garden. And hoping those scouts will make room for a few flowers on their allotment. As a person who has always been very excited by new things, it shocks me to be confronted with evidence of what a creature of habit I truly am. My kitchen table - June 17th and June 12th, a year apart. I may never have realized, had it not been for blogging. This post has sat on my screen all weekend. The idea being that seeing it there might trigger a suitable conclusion to my thoughts. But one has yet to arrive. So many of us seem a bit ho-hum about writing our blogs of late. It's not new any more. We're not striving to connect with our tribe. We're in our groove. Or rut, depending on how you think of it. There seems to have been an exodus of late (to the lure of Twitter, perhaps). But for me, there has always been, in the midst of the quest for the novel, a background comfort in the familiarity of routine. And so it continues. The bathroom has taken on the air of Miss Havisham's en-suite. I am having a go at preserving some of my mother's beautiful hydrangea heads. Sarah Raven reccomends conditioning the heads (which are really bracts, rather than flowers) by placing the stems in boiling water for 30 seconds and then laying them in a bath of cool water overnight. The next day, I shook them off and they are now standing in a solution of 1 part glycerin to 2 parts hot water. Once they have sucked it all up, they should remain soft and retain their colour. This might take as long as a month, but if it does, my heads ought to be ready to make into a Christmas wreath. Forward planning, people (she says, ducking...). We're just back from a week in Sark. Only it feels like we've been away far longer. I think that's probably down to the nature of the place - its a tiny island, with only 600 or so permanent inhabitants, whose ranks are swelled in the summer by people like my sister-in-law's family, who spend part of their time on the island, kicking back in an atmosphere far removed from everyday life. Some of that atmosphere is no doubt generated by the lack of cars on the island. Running errands and exploring by bike is far more fun, and removing the fear of traffic, gives the children a much higher level of freedom. Though, to be fair, what they wanted to do most was just to hang out with their cousins. I didn't grow up with extended family, and it's always a bit of a treat watching my boys do so. The garden of the house is truly spectacular. Outdoor rooms, with their own atmospheres, lush growth and imaginative planting. This is the herb garden. And there were the most amazing plant combinations, which I always think is the hardest trick to pull off in any garden. Not the kind of week you can pop into a travel agent and pick out of a brochure. Thank you Tess - unforgettable. Now we are back, and I am full of energy and conscious that these are the last few weeks of summer holiday remaining. There are shoe buying trips to squeeze in, play dates with chums and perhaps one last little break away from home yet to come. It's turning out to be a very good summer indeed. Surely I have shared my cutting garden fantasy with you before now? It goes along with the Georgian Rectory and cherubic offspring vision, where I do a lot of wafting about and someone else is responsible for the grunt work. But realization has dawned that in order to get to the end goal, I am going to have to overcome a few barriers. Never mind the obvious financial hurdles - the one I've chosen to tackle is my feeling of guilt over snipping blooms and foliage in my own garden. "unlike proper gardeners who can't bear to cut flowers for fear of spoiling the garden, I just can't let them die outside"
And somehow that made perfect sense to me and off I went, snipping with gay abandon. See, I can vandalize my own borders and be okay with it. But I did have a good laugh when I read this slightly shamefaced post on Tea for Joy about using the neighbours' overhanging roses as your personal cutting patch. Because I would find that a whole lot less painful! Perhaps my future actually involves a walled garden of the penitentiary variety. The boys and I headed off to Kew Gardens this half-term. It's one of those places I have been meaning to take them for ages, but somehow have never gotten round to. Does that happen to you too? Somehow, the precious weekend time often seems to get swallowed up with the odd errand or a birthday party or a sports event or guests and there are so many things I mean to do, but there never seems to be the perfect time slot. The best way to actually get them in the diary as a firm fixture seems to be external stimulus. In this case, an invitation for a Press Day focused on Kids at Kew. Well, it would have been rude not to, wouldn't it? Even if the early morning start was slightly against the half term grain, the gorgeous day more than made up for it. and even a couple of bloggers out in the wild... how's that for an incredible co-incidence? We climbed 18 metres up into the canopy (that's the Xstrata Treetop Walkway - undeniable highlight of the visit for the boys). Kew have made huge efforts to make a day out there fun for kids, with plenty to keep them happy and entertained and much to absorb. And as you may have gathered, I took rather a lot of photographs. Though none as accomplished as the ones which we saw at the IGPOTY exhibition (that's International Garden Photographer of the Year to you and I) which is on at Kew until September. Incredibly inspiring. In more than one way - firstly, naturally, to take pictures. But secondly, to make the most of every opportunity to see and enjoy the things that are on our 'must do sometime' lists. People and possibilities - strikes me as a pretty good mantra for our summer. Yes, it's true that I could have found auriculas slightly closer to home than London. But these are very special auriculas, from Petersham Nurseries. Where, after mustering the courage to drive into the big bad city, I met my Mum and sister-in-law, for a belated milestone birthday celebration lunch. Not my big birthday, I hasten to add. But that's no reason for me not to drink Rose Petal Prosecco and eat squid and clams on brushcetta with aioli. It's a tough job, celebrating! We had an excellent time, wandering round the nursery, coatless in the early Spring sunshine. The best thing to me was that at Petersham, they understand about doing things with style. Take these Auriculas - they were the only variety there, but could there be a more lovely version to sell? And so, on my part, there was no hesitation at all in picking them up and bringing them home to make me smile every time I reach my own front door. Do you sometimes find that when you buy something, it is less about the thing itself, than about trying to capture a little bit of the essence of the place you bought it from? And that somehow adds value beyond that of the object. That sense of place is so hard to define, but is something that good retailers understand instinctively. And something that I would like to achieve in our home. A real sense of place. And hoping that little by little, these meaningful objects add up to just that. Comments are a lovely thing. A little e-mail in box full of good cheer. But sometimes, I get a comment that is totally unjustified. And I don't mean a nasty one. On the contrary, it's usually someone paying me a compliment that I really really don't deserve. About having a tidy house, or beautifully behaved offspring, or managing to 'do it all'. And I laugh, and sigh a bit, and wish I had truly earned those accolades. So before you pass judgement on my Amaryllis. I feel I must come clean. It was all a big mistake. See, I bought the bulb last year, planning to force it for Christmas (like normal people do). But in my frantic disorganized manner, I forgot to do it. And then 'lost' the bulb in the garage (because it's like a black hole out there). Then I found the bulb, but was too riddled with guilt to do anything about it because it was too late. Then I panicked that I had wasted money, so I stuck it in a pot about 4 weeks ago. And look how it has rewarded me. Sometimes we get so much better than we deserve. Oh the joy of full speed internet connection. All the easier to make apologies for my appalling lack of comment replying and blog commenting over the past couple of weeks. How rude of me. It would probably have been better to take an oh-so-self-controlled break from blogging altogether, but I couldn't do it. The mere thought of it makes my fingers go all twitchy. So, sorry about that, but I promise to do better, right after I wade through the laundry mountain. And tackle the decimation in the garden. The veg patch has an air of the apocalypse about it. While we were gone, the snails were clearly having an Italian Special Week and totally decimated my cavolo nero. And I'm not exaggerating. Look. It looked like rain this afternoon, so I thought I might go and salvage a precious flower from the garden, before it was spoiled. Having a cutting garden is a long standing fantasy of mine. To head out through the dewy grass, load up my trug, and enjoy the blooms inside the house. I even got as far as buying the book many years ago. But I find I have a guilt complex when it comes to actually harvesting the flowers. The empty spots in the borders look at me accusingly and I feel I have wasted the life of the plant for a brief moment of satisfaction. Strange emotion, guilt. I feel the same way about ditching a product I bought but didn't like. Take this surface cleaner for example (matches my flower, dontcha think?). I was seduced into buying it by the pretty, yet understated packaging and the unusual colour. But I'm sorry to say, that the smell reminds me of vomit. So why am I still feeling that I have to use it up? Guilt over waste has a lot to answer for. Having mistakenly weeded out my beloved cow parsley from under the tree earlier this Spring, Johnny and I were forced to ransack the hedgerows for this bunch instead. But I have had one gardening triumph. Look out through the window. In January the wisteria got a stern talking to. Something along the lines of "If you don't flower this year, it's the axe for you matey". Seems to have done the trick. Giving in (reluctantly) to the reality that cold weather has arrived. The car has needed de-icing on two mornings already and I'm very glad that I brought my Jade trees in from their summer holiday outdoors when I did. They are also known as Money Plants and they are meant to attract wealth - or so the Feng Shui experts suggest. One of the few bits of Feng Shui information I ever retain is the importance of shutting your toilet lid, or else your good luck goes down the pan. Fat chance of implementing that one in this house. It would be a miracle if I could get the boys to remember to raise and lower the seat appropriately. Blogging at the weekend - it's just not popular is it? I always feel like a bit of a billy-no-mates here at my computer on a Saturday or Sunday. Like everyone else has exciting and fun weekend plans which render them far too busy to go near a monitor. And it's worse with this being a Bank Holiday Weekend and all, but hey, I have no shame and an A to Z to complete by the end of the month. It's also been unusually quiet at home. Mark is spending the week with his Grandparents and Johnny has been really missing his big brother. It's just not as much fun playing cars on your own - nobody to fight with. Roll on Tuesday when they can return to the normal schedule - play, fight, yell and scream, get separated, find themselves magnetically attracted, play - and on and on it goes 'till bedtime. And a photo of my Rudbekias for Amy. She's after late summer excitement in her garden and these are fitting the bill in mine. 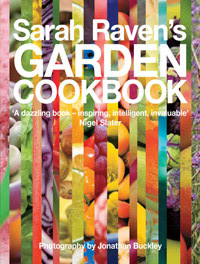 I've been a big fan of Sarah Raven ever since I began gardening - I own her book 'The Cutting Garden' which sets out to help you plan a space which provides you with plenty of cut flowers (and greenery) for your house, without your borders looking pillaged. In my personal fantasy future, I spend a great deal of time wafting around my walled garden, collecting blooms in a suitably vintage trug and arranging them with casual elegance. Reality involves more yelling of 'Keep your truck out of my flowerbed', but hey, I can dream. I've noticed that a lot of gardeners are foodies. It makes me trust them more. Personally, I can't see the point in growing a swede as big as a boulder if it's inedible. I feel the same about growing onions - why? When they are dirt cheap at the greengrocers and don't taste any better for being freshly harvested. So I was very intrigued to see this offering on the bookshop shelves. Now, I've only had a twenty second flip through this, but it's already it's on my wish list. The recipes are arranged according to a central ingredient that you've harvested from your garden (or at least bought in season from the supermarket!). That struck me as hugely sensible - 20 things to do with rhubarb, because it's coming out of your ears at the moment, but you want to make the most of it being in season. Now all I need to do is make some space on my overloaded cookbook shelf. I find parting with cookbooks difficult. There's something about the patina of food splashes which makes them very personal. No draconian uncluttering advice for me! Another week gone - is it really Monday tomorrow? I've been taking it easy this weekend, because I have damaged a disc in my lower back. Was it a dramatic accident? Nope - sneezing. Just one more reason to hate hayfever. And let's face it, the weekend (with super-hubby springing into action) is the only chance I'm going to get to rest my back. Just try potty training without bending over - hmmm, I think not. All your potty envy really had me laughing, so here's a link if you need a racing potty of your very own. Hero-of-the-moment Hubby has also been in charge of the new baby - the raised vegetable bed. The soil in our garden is terrible - compacted clay, so I decided a raised bed, in the weird bit of garden tucked around the side of the house might be the way to go. We built it from a great set of recycled plastic link-a-bord, which is the easiest thing in the world to construct. Much sieving of home-made compost and leaf mold later (probably assisting in the demise of my back) and we'd filled it with enough super nutritious earth to plant beans, parsley (flat and curly), spinach, oriental salad leaf mix, chives and a few sunflowers. Now it's just a question of water and wait. Oh, and remove cat turds. Because every feline in the neighbourhood is making a bee-line for it.